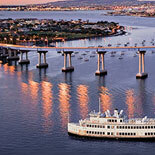 Hornblower Cruises & Events invites you aboard a magnificent, luxury yacht for the San Diego Dinner Cruise. Savor, indulge and unwind as you enjoy the sights and sounds of beautiful San Diego Bay! Magnificent skyline views and refreshing ocean breezes aboard a sparkling dining cruise! Welcome, to the Hornblower experience! Where the celebration begins the moment you come aboard. Start with cocktails on deck, then relax as a gracious crew transports you to a world of ease and luxury. Enjoy the finest in gourmet cuisine, surrounded by spectacular bay views on one of Hornblower's luxury yachts. 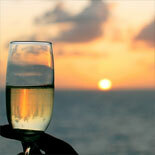 Enjoy magnificent skyline views and refreshing ocean breezes aboard a sparkling dining cruise! Consistently providing excellent guest experiences has always been the Hornblower style. From it's beginnings in 1980 as a two-ship operation in San Francisco Bay, Hornblower has focused on exceeding the expectations of its guests, and on maintaining the highest standards of safety and comfort for it's vessels and facilities. Whether you are a tourist looking for the best way to see San Diego attractions, or a local that knows the best way to entertain out of town guests, the Hornblower San Diego Dinner Cruise has it all. The "Big Bay," as locals call San Diego Bay, plays host to the scenic sights of the Coronado Bay Bridge and Seaport Village, to name just a few! It also boasts some of America's most historic ships, such as the U.S.S. Ronald Reagan and the USS Midway. 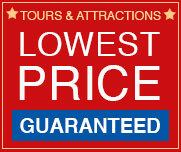 So, make a reservation and buy your eTicket today and experience this spectacular Hornblower San Diego Dinner Cruise. All Aboard! Grape Street Pier and Ticket Kiosk, 1800 North Harbor Drive, San Diego 92101. Open everyday from 8:30 a.m. - 7:00 p.m.
Harbor Dr. and Broadway Ave. Parking is available in the Five Star parking lot, located on the corner of Pacific Coast Highway and Broadway, on a first come, first serve basis. Hornblower does not validate. Metered parking spots, with a 3-hour maximum, are available across from the ticket booth Monday through Saturday until 6:00 p.m. They are free after 6:00 p.m. and on Sundays. All ages are welcome. Minors require adult supervision. 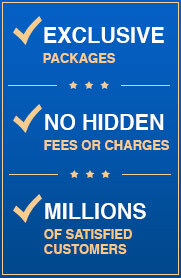 Passengers over 18 years of age are required to have valid photo identification Child age: 4- 12 years. Under 4 are free. Reservations are required and must be reconfirmed 24 hours in advance of tour. Hornblower does have handicap accessible yachts in the fleet. Please check with Reservations for more details. Smoking is allowed on the outside decks only. 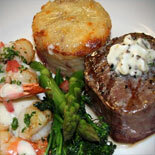 A vegetarian option and most other special dietary needs for dinner are available. Let reservations know when booking. Dress: California Casual. Attire such as khaki pants and a collared shirt are fine. Business casual is more common for dinner cruises. Bring a light jacket or wrap. Hornblower sails rain or shine. In the very rare case of severe weather conditions or upon the direction of the U.S. Coast Guard, we will remain dockside. Dinner service begins approximately 30 minutes after leaving the dock. Service is leisurely to provide time to take in the sights or stroll the decks. *Free child promotion not valid on the following dates:* 11/27, 12/5, 12/6, 12/12, 12/13, 12/14, 12/19, 12/20, 12/21, 12/31, 2/13, 1/2, 1/9, 1/16, 1/23, 1/30, 2/6, 2/13, 2/14, 2/20, 2/27, 3/6, 3/13, 3/20, 3/27.